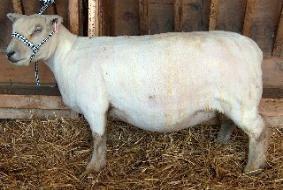 moderately broad, but not so broad to be a birthing obstruction, and with medium length. 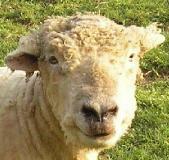 be perpendicular to the ground and covered with some degree of wool. but not Roman. 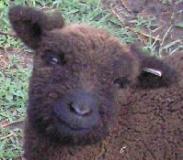 The wide muzzle gives the Babydoll sheep its classic Smiling look. 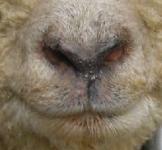 Muzzle and face should be moderate in width and length, with a straight or slightly dished nose. Never a roman nose. 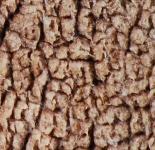 preferred but blended shades or mottled accepted. 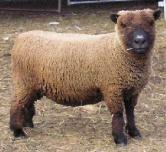 Black muzzles and legs on Black/gray or spotted fleeced sheep. 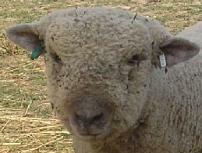 Some graying on nose of Black sheep with age. preferable., blends of shades are common but less desirable . 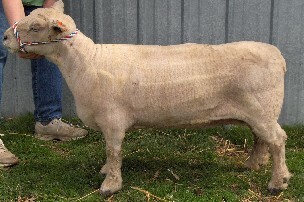 off white is undesirable and will be disqualified in the show ring. BLACK ON FACES AND LEGS. to be spots ,but which grow out & fade usually by 6 months of age. does vary. It seems to be under pretty complicated & likely polygenetic control . results in the coloration of the face and legs . all. White sheep having pure white faces and legs is a disqualification and these sheep must be sold unregistered. 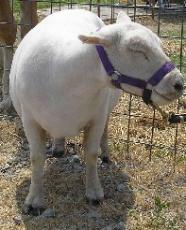 The neck is moderately long and upright, wide at the base and laid well into the shoulders. The LOIN should be long, wide and thick. 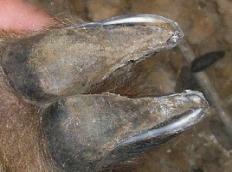 The hoof color should be black or gray and may have some white stripes. Solid white hoofs are a disqualification. 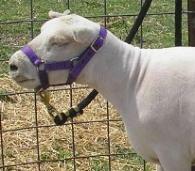 LEGS, short, straight, well placed at corners, lower leg wool & hair color similar to muzzle color. the ground on shorn sheep. 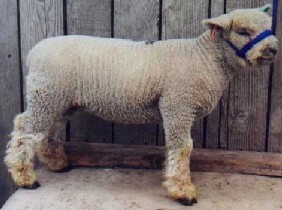 BABYDOLL SOUTHDOWN SHEEP should be from 18-24” tall. 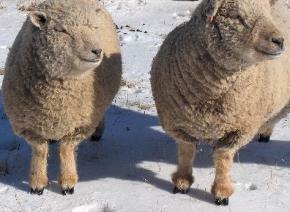 Most Babydoll Ewes fall into 19-23” range and most Rams 22-24” range. 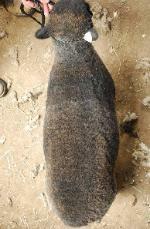 and should not be registered and can not be shown as a Babydoll Southdown. 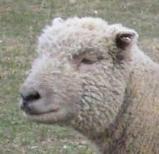 above 26" for rams and any sheep below 17" are disqualifying . 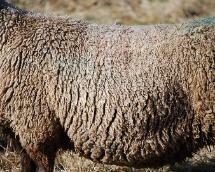 Rams look more masculine and are usually larger than ewes. They should all be rectangular looking, on a moderate frame. 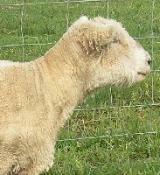 Rams and ewes should move with freedom of gait and remain active and sound for a similar period of 8-10 years. 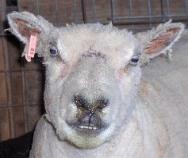 exception of during lactation, & lambs in their first year. 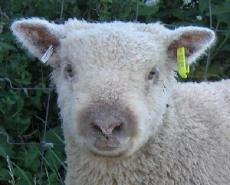 produces poorly muscled and unthrifty lambs and breed integrity should be up-held above all. producing offspring without that fault. 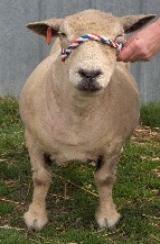 not just the 'ideal show quality' sheep. 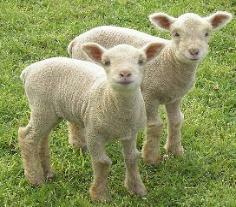 All Sheep pictured below are within breed standards unless noted as such. 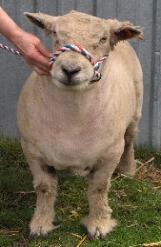 registered as Babydoll Southdowns with NABSSAR. 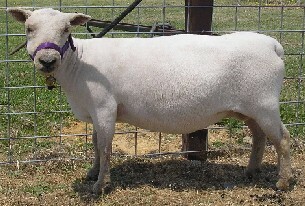 this breed is known for. 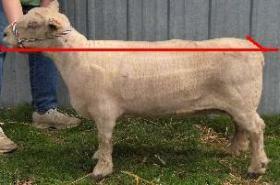 the width at the hips to facilitate easy lambing. Excessively Flat & wide topped shoulders should be discriminated against. more of a square shape and short coupled body. good pasterns. Tail head is level with bottom of jaw. Good front leg placement and good rear angulation. of space between the front legs. 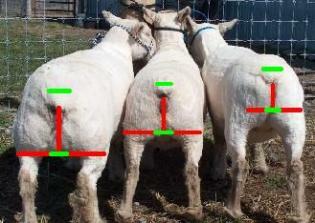 The tail head should be in a line level to the chin when the sheep is standing in a natural alert stance. chin, when standing in a natural alert stance. Full, well let down, with a deep, wide twist and heavy muscling. Thighs and twist should show deep and heavy muscling. helping me with this webpage! 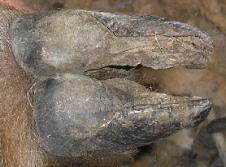 left has straight legs and correct pastern angle. pasterns that are to long and low. legs at a side view. not desirable as solid coloring. had no dark hair at all it would not be registrable. thigh and deapth of twist. 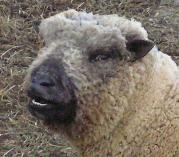 wool blind. 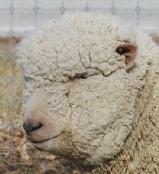 Tear ducts should not be over woolly. Example of common colors: Black, White and Gray. 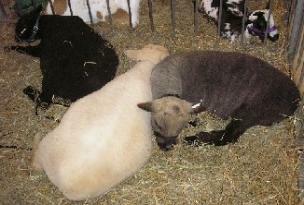 Note gray sheep has black legs and muzzle. 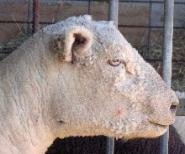 Ears are of medium thickness, moderate in length, level to the poll, proportionate to the head and preferably covered with wool. Short rough hair is acceptable, slick haired ears are discriminated against. 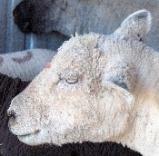 Gray, Black or brown-specked ear skin is common. 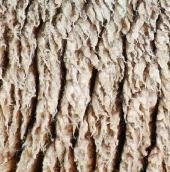 the ground and covered with some degree of wool. Eyes should large bright, brown to yellow. When judging the EYES (2 points)Large, bright and prominent. Yellow to brown in color. 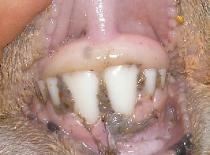 Incisor teeth should meet the dental pad. 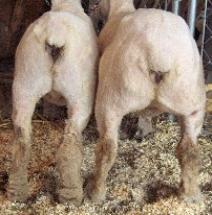 This ewe and ram lamb pictured above are showing very "true to type" all over conformation. as long as they are not solid white with no coloring at all. 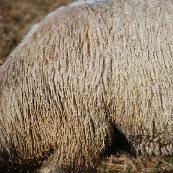 should extend to about the knees where the body wool meets the hair. 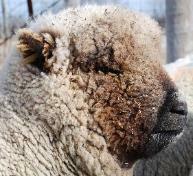 muzzles as the sheep ages. 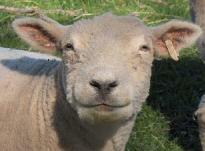 want a sheep to have a 'bright' pink nose with no pigmentation on it what so ever. 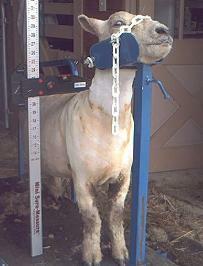 hoof is trimmed to short. width at the hips to facilitate easy birthing. If you are revisiting this page remember to hit your 'Refresh' button so any new additions can be viewed. seen, with comments on them. 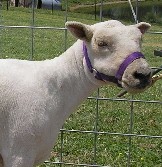 All ears pictured above are within breed standards. This is to help a person to know the ideal ear set to look for as 'best'. 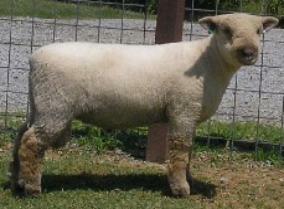 sheep pictured above are yearlings. 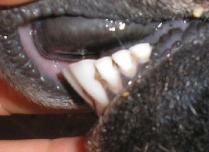 Note the two larger teeth in front and lamb teeth on the sides. 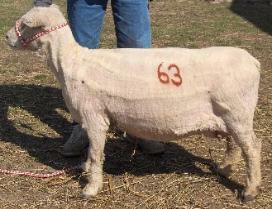 ewes could use improvement on this. and her tail head being level with chin. Her slight slope of croup is correct. 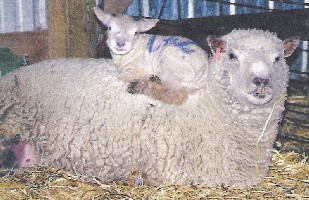 tail and croup than ewe #2.
photos on this website. And I could use many more photos to show varied conformation. 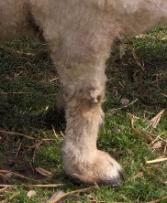 when actually they are nice correct legs when seen sheared. 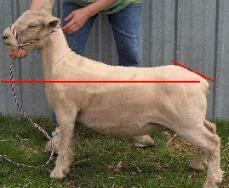 FAULTS EXPLAINED: There are two types of "Faults" when judging the Babydoll Southdown. 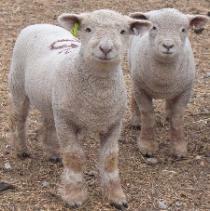 Conformation faults and Breed Type faults. A good way to describe this is that Structural or Conformation type faults are generally more serious as they affect function or reproduction. The front of the face should be straight or slightly dished, no roman noses. These stripes easily wash off. from very light tan to cinnamon to black. 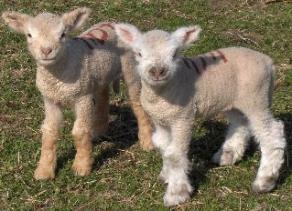 markings on face and legs. Picture #1 Fine fleece has a very tiny crimp in fiber. group up and fall open . 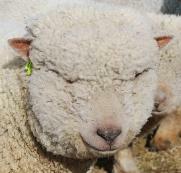 Fleece or Wool quality has been evaluated in several ways over the centuries. 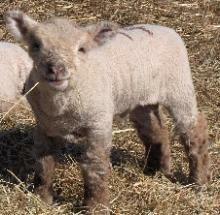 * Staple length: The length of a 12 months growth of wool fiber not stretched. 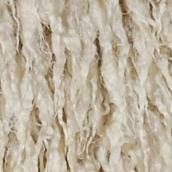 * Crimp: Waves in the individual fiber, small waves close together are softer fleece. Waves further apart are coarser. * The term 'Blood': Used to interpret fineness displayed in fractions. * Spin count: Measurement on a wool Skein. to a 60 to 62 skein spin count and a fiber of 22.5 to 25 microns in diameter, with medium fine crimp and 2.5 to 3"
staple length. 3/8 blood translates to a 58 spin count and a 24.5to 26.5 micron with medium crimp and 2.5 to 3.5"
medium coarse crimp and 2.5 to 4" staple length. 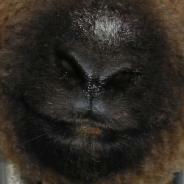 Faces: Below are different examples of the types of faces seen on the Babydoll Southdown Sheep. 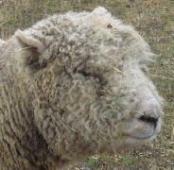 wool blind do need to be trimmed regular around the eye area so the sheep can see well and not become 'blind'. from, should be long wide and deep. 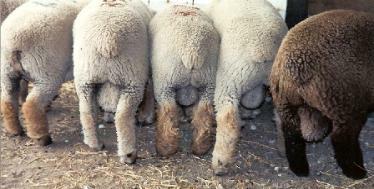 The rear legs which are the roasts or steaks should be well muscled and large. different sized Twists for each sheep.